Italian cinema, is probably my favourite after hollywood. I cannot even think a list without an Italian film in my favourite films list. 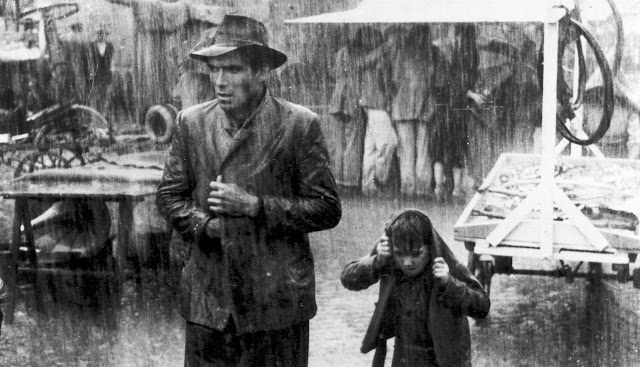 As far back as I can remember, The Bicycle Thieves was the first ever non-hollywood and non-bollywood film I ever saw, and yet till date I haven't seen any better film in those category then The Bicycle Thieves. This is a small little story of a man Antonio Ricci, who along with his son Baiocco is in search for their stolen bicycle. That is it, that is what the plot is. This film is emotionally draining, this was the most close, I ever could come to crying in film, even though I didn't, but that ending, it's just to emotionally hard to watch it. Words would be less to tell you, how much I love this film. It is perfect in every way, the actor's were amateur but not once it felt like that, they did a gave a very realistic and subtle performance. De Sica, known for his acting, did some of the finest filmmaking I've ever seen, and he might be my favourite director from Italy, second close coming is Mr. Visconti. The score, itself is an achievement, I have rarely seen film score's matching with the plot of the film, but here it was just perfect. This is one of the most beautiful film I've ever seen, also it is one of the most meaningful film ever made. This is beyond what a film is, it is emotionally draining, it is very powerfully crafted piece of work. The opening scene's are such joy to watch, but as the film progresses, I just wanted nothing but the father and son to find the bicycle. That bicycle wasn't just an bicycle for them, it was really something more. The ending is at times I think is tough to watch (in a good way), as the man who is desperate is being caught but not the man who is free and stolen is still having a nice time. The situation that it creates, I think, this film is beyond the word's, it is path-breaking in a small way. Whenever, I set to watch this film, I always end up depressed because of the circumstances in the film. This film really in a way a film that played an important role in changing my life, as I was immediately wanted to see more world cinema after watching this. 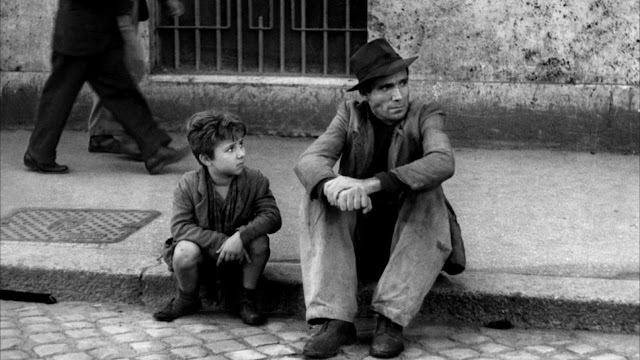 But, till date I've seen many films from all over the world, but for me, none has matched what The Bicycle Thieves did. Vittorio De Sica, thank your for making such a great film, that is beyond words! Hope you enjoyed my seventh instalment in favourite films series!